After exhausting the holiday reading materials I picked up at The Warehouse for a very reasonable $15 (Robert Lacey's The Year 1000, Bob Woodward's Bush at War and Robert Harris' Pompeii), I found myself browsing the dusty paperbacks lining my parents' bookshelf. I came across an old favourite of mine, Stephen King's superb collection of short stories, Nightmares and Dreamscapes. The collection was released in 1992 and while all of the stories (bar the non-fiction New Yorker piece Head Down which deals in intricate detail with Baseball) are great only one has stayed with me during ten years since I first read the collection - Dolan's Cadillac. I love stories of revenge, not hot-headed, passionate reprisals but stories about the vengeful who wait calmly for years to pass before they mete out their perfectly conceived pay back. Robinson, the main character in Dolan's Cadillac is such a person. The story outlines his ten year pursuit of the crime boss who was responsible for his wife's death. It involves a Cadillac, some heavy machinery and a 42 foot hole in the Nevada highway. It's King's best short story of those included in the four large collections he's so far put out. There was talk at one stage of making it into a movie. I hope it comes off because, done properly, this could be very good on screen. Unfortunately, many of King's adaptations turn out crap. For every Shawshank Redemption there's a Tommy Knockers and Riding the Bullet. "Then came the dumpsters with their fresh loads of gravel, follwed by the spreaders and rollers. After them the big tankers would arrive, the ones with the big wide sprayer attachments on the backs and their smell of hot tar, so like melting shoe leather. And when the fresh asphalt had dried , along would come the lining machine, the driver under his big canvas parasol looking back frequently to make sure the broken yellow line was perfectly straight, unaware that he was passing over a fog-gray Cadillac with three people inside, unaware that down in the darkness there was a ruby ring and a gold Rolex that might still be marking off the hours..."
According to Stephenking.com, Nightmares and Dreamscapes is being made into an eight X one hour TV series. That explains the rumour about Dolan's Cadillac being adapted. The story could be very nicely told in 45 minutes (the rest of the slot taken up by adverts. Some decent screenwriters, including Larry Cohen, who adapted King's IT and Carrie are writing the scripts so it looks promising. 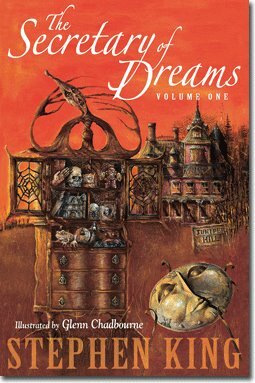 Also, King is putting out The Secretary of Dreams, a reissue of half a dozen of his short stories in graphic novel format, accompanied by illustrations in pulp horror comic style. Included are a couple of my favourites, The Road Virus Heads North and Home Delivery. I'll be putting in a order through Paypal for that one. If any contemporary author shows there is huge interest and appeal in overlooked form of literature, the short story, it's Stephen King. i also heard that Sylvester Stallone and Kevin Bacon were rumored to star in the FILM version back in 2001...but of course it fell through. This would make a GREAT film...and I cross my fingers that it will be made in my lifetime....and im only 20!! !